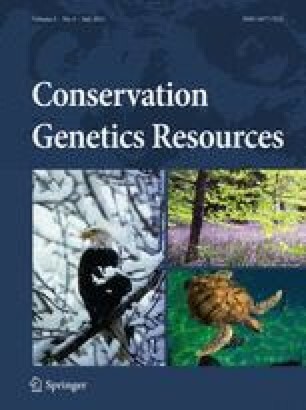 Twenty one polymorphic microsatellite loci for the Japanese dace (Tribolodon hakonensis) were isolated and characterized. The number of observed alleles per locus in 32 individuals ranged from 3 to 30. The observed and expected heterozygosities ranged from 0.125 to 0.969 and from 0.175 to 0.973, respectively. All loci conformed to Hardy–Weinberg equilibrium, no linkage disequilibrium was observed between pairs of loci and no loci showed evidence of null alleles. These microsatellite loci will be useful for investigating the intraspecific genetic variation and population structure of this species. This study was supported in part by a Grant-in-Aid for Scientific Research (C-20580270, C-21780228, C-22580281 and B-22380133) from the Japan Society for the Promotion of Science. The first author would like to thank Mses. K. Yamanoi and P. Goto for analysis support.